Working with Sony Design Center (LADC) Aeolab designed and developed two working prototypes of electronic devices aimed at children and powered by harnessing user-generated kinetic energy. 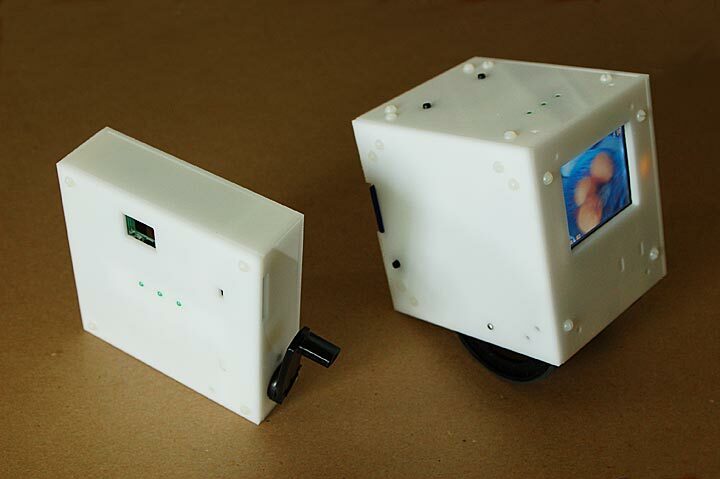 The camera prototype has no battery and no buttons - pictures are taken continuously while the hand crank is turned. The image viewer contains a lithium battery that is charged by driving the device around on its wheels. Energy input is indicated by the blinking sequence of LED lights. Both prototypes were part of a presentation introducing the concept of the new eco-conscious Sony ODO line of consumer electronic devices, unveiled in Tokyo in the spring of 2007.